Nominees to Nobel Peace Prize not source of pride in Norway? t’s interesting to use Google News to follow the press trail of a breaking story. I did just that with the recent news that there are 241 nominees for the 2011 Nobel Peace Prize. Actually, I set out to trace the story back to the original Nobel Peace Prize Committee’s press release – because there must have been a press release, right? I can’t find it. Perhaps the Peace Prize Committee make a verbal announcement which the news agencies pick up , but I’m surprised, 22 hours after the announcement that I still can’t find the press release on the net. I know it’s about 22 hours since the announcement because Google very helpfully gives that information. There, you see, 22 hours ago, the Associated Press (AP) broke the news internationally and KTUU in Alaska was the first to broadcast it. My search was sparked off by seeing Swedish Radio International’s report “Record number of Peace Prize nominees”, which is about 19 hours old as I write. I was going to publish this link on Twitter (as I do from time to time) but thought it would be more fun to find the original English language announcement – or perhaps a report from Norway in English. Well, as I say, I couldn’t find the press release. Nor could I find anything in English from Norway. Unlike Swedish Radio, the Norwegian Broadcasting Corporation (NRK) doesn’t offer an English language service, and none of the Internet-based English language news services from Norway that I’ve looked at (The Foreigner, The Norway Post, Norway News or News in English Norway) have anything yet to say. Still taken up with the Nordic Skiing Championships. But in Norwegian though? Not much. As far as I can see NRK is ignoring the Peace Prize Committee. In the on-line newspapers, though, there is more interest. The first article Google finds is from the Norsk Telegrambyrå (Norwegian News Agency, NTB) and published in the Trønder-Avisa newspaper (from 22 hours ago) “241 nominasjoner til Nobels fredspris”. Before this news, the most recent Norwegian reference to the Peace Prize committee is in Aftenposten, published on 28th February: “The Peace Prize Costs Norwegian Business Life Dearly” (my translation of “Fredsprisen koster norsk næringsliv dyrt“). 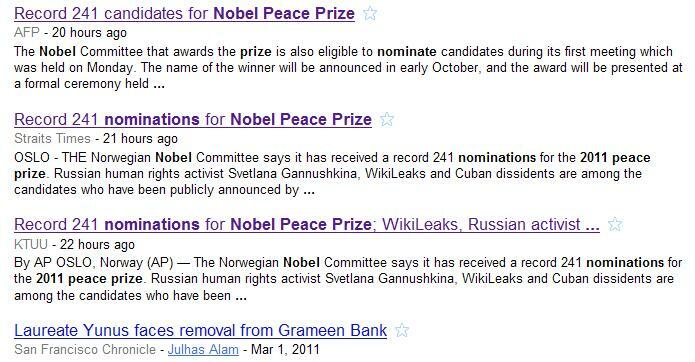 Can that explain why the Peace Prize seems more interesting to people outside Norway?